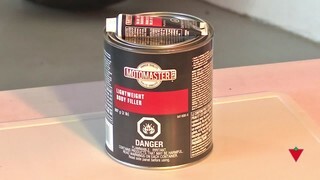 TRANSCRIPT MOTOMASTER LIGHTWEIGHT BODY FILLER Logo: Motomaster Lightweight Body Filler Caption: Can I repair a door dent? Man: You mean the minor body damage that you get in a parking lot can be really expensive to have repaired professionally, but you can achieve the same results with the Motomaster products yourself at home. Onscreen Text: Can be applied to bare metal, galvanized steel, and aluminum. Man: Motomaster Body Filler is the same type of product that is used every day by body shops coast to coast. Woman For our small dent repair we are going to need 80, 180, 320 grit sand paper, gloves, sanding block, masking tape, our Motomaster Body Filler, and cream hardener, plastic spreader, adhesive remover, and a plastic mixing board. Caption: Read the product directions carefully before beginning the repair. Onscreen Text: Prep Phase Woman: Now we have already washed the car but before we get started you will want to clean the affected area with solvent and a clean rag to remove any dirt oils or grease. Onscreen Text: Use acetone or wax & grease remover Man: You will need to mask off about 2 to 3 inches around the repair area to prevent any other areas of the car being damaged. Woman: So now we are going to use the 80 grit sand paper and sand the affected are right down to bare metal. Now that we are finished sanding you will want to wipe it down one more time to remove any sanding debris. Onscreen Text: Filler Prep Phase Man: Before mixing the body filler you will have to remove the lid and that is where you will find the cream hardener. So for the dent we have on this door here you will want to mix about a golf ball size of filler. To mix the body filler correctly presuming this was the golf ball you would run a line across from end to end. Caption in Image: Easy to mix and spread! Motomaster Body Filler is vacuum processed so it eliminates the potential for air pockets that are common when you apply body filler. Motomaster has a colored catalyst to allow you to know when it is thoroughly mixed. So now that the body filler is mixed you have about 5-6 minutes to apply to the car before it starts to cure. Woman: Osncreen Text: Application Phase Woman: Now we are going to apply the filler and you will want to apply in very thin layers. Man: Motomaster Body Filler is a tack-free formula so it leaves less sticky material at the top when the product is cured so it’s considered a clog free formula and it cures a fair bit faster than most other brands. So when the filler has been applied to the car you’re usually looking at between 15-20 minutes before it’s ready to be sanded. Woman: Now that the body filler is fully cured you’re ready for sanding. We’re going to use the 180 grit sand paper for this part of the application. Man: So, you’re one step finer, and then you want to go to the finest 320 when it’s time for priming. Woman: So you will just want to wipe off some of the sanding dust and now your car is ready for primer and paint. You know it’s not bad for my first body repair! Man: Good job!